The 18-hole golf course at Heritage Shores offers everything you need to enjoy a day on the links including a full-service pro-shop and a restaurant. 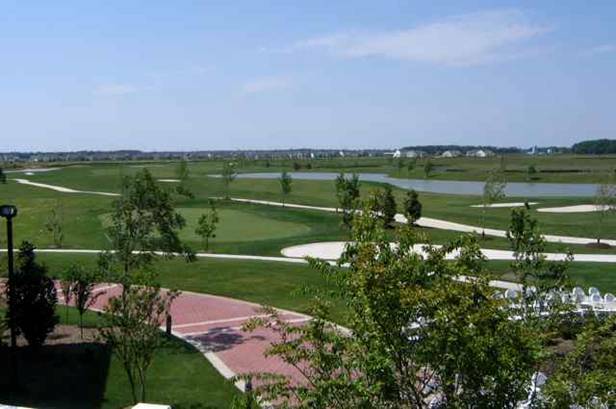 With its world-class amenities and plans for 2,000 residences, Heritage Shores is one of the largest active adult communities in Delaware. The community is specifically designed to appeal to residents aged 55 or better with a wide range of social and recreational activities. This makes it easy for new residents to make friends and explore many previously undiscovered talents and interests. As the hub of community activity, the 28,000 square-foot clubhouse offers many recreations. The grand ballroom, with a dance floor and stage, can be utilized for many different parties or community events. The expansive terraces offer spectacular views of the picturesque golf course, and the Passwaters restaurant provides fine dining and a relaxing bar. The spacious clubhouse is also designed to support many different hobbies and pastimes. It offers a billiards and card room, a library and computer center, an arts and crafts studio, and a wood workshop. Special interest clubs include popular groups such as the Fiber Arts Club, Bookies Book Club, Red Hat Ladybugs, Vine Chasers, Computer Geeks and the Games Club. A full-time Activities Director is on hand to help organize community activities. At Heritage Shores’ Fitness and Aquatic Center, residents will find many ways to stay in shape. Highlights include a state-of-the-art fitness center, a dance and aerobics studio, indoor and outdoor swimming pools, and four tennis courts. The beautiful grounds also offer miles of walking and biking trails. When it comes to golf, Heritage Shores is an 18-hole Arthur Hills championship course which stretches over 7,000 yards from its longest tees. This challenging course was designed in a classic links-style with many water elements. To keep their skills sharp, resident golfers can make use of the practice facilities, which include grass tee stations, putting greens and chipping areas. There is also a golf pro shop and the Sand Wedge Snack Bar with lovely outdoor seating. Homes at Heritage Shores are built to support energy efficiency and low-maintenance living. Though the community was originally started by both Brookfield Homes and Lennar Homes, today’s new construction homes are primarily built by Providence of Brookfield and Ryan Homes. Buyers also have the option of purchasing a custom lot to be developed by a designer of their choosing. When looking for a fabulous 55+ community on the East Coast, many active adults have discovered the benefits of choosing a home at Heritage Shores. Its prime location, exciting amenities and flexible home designs combine to make Heritage Shores an area stand out.